Camping L'Aiguille Creuse är en camping i Les Loges, Seine-Maritime. Campingen har platser med stängsel, utan skugga och platser med lite skugga. Det finns möjlighet att hyra husbilar. På campingen finns en lekplats. Denna inspektör gör varje år ett besök på Camping L'Aiguille Creuse och inspekterar campingen för ca 200 faciliteter och för andra förekommande punkter. Inspektören är en medarbetare från ACSI och arbetar inte för campingen. We stayed at this campsite for 3 nights during our tour of Normandy. The site was good for exploring the area, we did a cycle ride from the site and the roads were quiet and cycle friendly. The staff were very friendly and spoke good English. There was always hot water for the showers. These were cleaned regularly and the toilets were the same, clean and inside. Some of the pitches had a slope which may cause some caravans a problem when pitching up, most of the pitches were level so choose your spot carefully. Vill du boka campingen Camping L'Aiguille Creuse eller få mera information? Det går bra med nedanstående uppgifter eller via campingens webbsida. 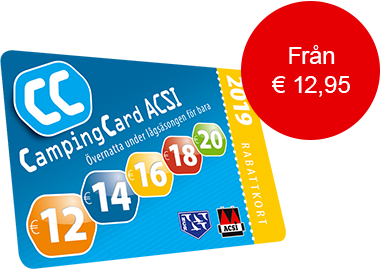 ACSI Eurocampings skickar din informationsförfrågan till "Camping L'Aiguille Creuse".